Chinese drivers are rushing to buy sport-utility vehicles in an "arms race" for safety on the country's hair-raising roads, analysts say, as SUV sales hit the gas despite a slowing economy. "The primary reason is a fairly primitive one," says Robin Zhu, auto analyst at Sanford C. Bernstein in Hong Kong. "It's about survival. "It's about people's desire to feel safe on the roads. Because [SUVs] are bigger, and in low-speed collisions, from a consumer psychology point of view, you'd rather be the one in the SUV." 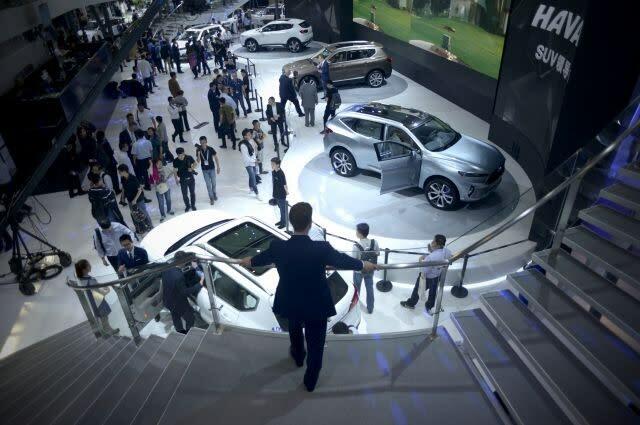 Another 50 models new to the Chinese market will go into production in the country this year, according to consultancy IHS Automotive, many of them to be showcased at the Beijing Auto Show opening Monday. The World Health Organization estimates that more than a quarter of a million people are killed on the country's roads every year -- over four times official government statistics. A businessman in an SUV in Beijing, who asked not to be named, told AFP he chose it "because it makes me feel safe when I drive". Bill Russo, automotive chief of advisory Gao Feng in Shanghai, said the appeal of an SUV comes from a feeling of "command" and the perception "you can deal with anything the road throws at you". "There's a bit of an arms race going on," he explained. "The so-called SUVs today are sedans on stilts," said Zhu. The most popular models are "small, car-based crossover types", said Russo, noting that "the vast majority" have engines smaller than 2.0 litres. "They're economical SUVs, they're not big, gas-consuming environmentally unfriendly vehicles," he said. Ten years ago educated urbanites preferred sedans because larger vehicles were associated with rural people and construction workers, he said. But in the last two years, SUVs have become "fashionable". "They're not that interested in acceleration, passing, speed. They're more interested in the look," said Dunne. But the boom may not last, executives warn. "Even if now the SUV is popular, in the future there will probably be a change," said Toyota China head Hiroji Onishi, suggesting that minivans could see their appeal widen. At the same time, while higher margins in the SUV segment have made the vehicles a driver of profits for foreign automakers, increasingly popular cheaper local models have made significant inroads in claiming market share. The best-selling SUV in China, the Haval H6, costs from 88,000 yuan ($13,600) according to the company's website. The best-selling foreign-brand SUV, the Volkswagen Tiguan, go for 200,000 yuan and up on major car sales portal Autohome.